What did you do with your extra hour? Did you get some much needed sleep? Did you finish that project that you just haven’t been able to fit in? I know, there are always too many things on the list, and not enough time to get to everything. That extra hour though is a gift, a luxury, and one that I look forward to each and every year. This fall things have been a little crazier than normal, with all of the Seattle Public School drama that has been going on. From the changing bell times, to the budget cuts, the district has kept my family and I on our toes for what has been a very tumultuous ride. Just when I think that things are getting better, another tree falls in the middle of the road, and you just stop and wonder how you are going to keep moving. The latest email I received once again brought my older daughter to tears. She has seen it all – and it has not always turned out for the best – but she is dealing with it. At 13, she is definitely experiencing real life. So what did I do with my extra hour? 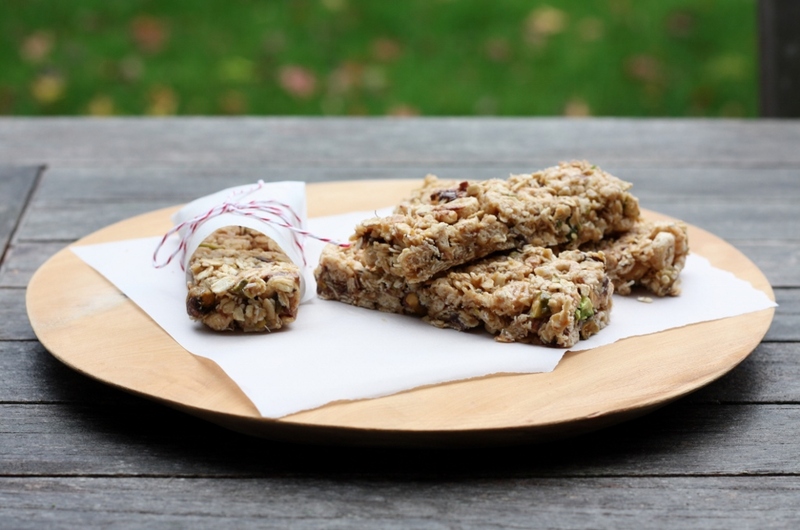 I made some granola bars – some delicious chewy no-bake granola bars which I adapted from Cooking Light. And the best news is that it didn’t take the whole hour. And because of that, I actually had some time to post these tonight. So if you haven’t decided what to do with your extra hour…why not spend it in the kitchen? It certainly made my day a little brighter. Combine first 6 ingredients (through salt) in a large bowl. Combine peanut butter and honey in a saucepan over medium heat. Cook 3 minutes or until peanut butter melts, stirring frequently. Mix in the chocolate chips. Pour peanut butter mixture over oat mixture; stir well to combine. Spread mixture into an 8-inch square baking pan coated with cooking spray; press firmly to form a compact, even layer. Place pan in freezer for 10 minutes. Remove from freezer, and cut into 12 bars.